What do do if your car has been weather-damaged, whether it’s been waterlogged by heavy rain or dented by falling debris. The first thing to be aware of before attempting to claim for weather damage is that you will only be covered if you have a comprehensive insurance policy. Third party and third party, fire and theft (TPFT) policies only cover damage caused to other cars and property, and will only pay out for damage to your car if it was as a result of fire or theft. If you do not have a comprehensive insurance policy you will need to pay for any repairs or replacements yourself. If you are able to make a claim on your comprehensive insurance policy, you should be able to recover any repair costs or even the cost of a replacement if your car is not salvageable. You will likely have to pay the excess on your policy, which will have been previously agreed with your insurer. Unfortunately your premiums are likely to increase slightly after making a claim for storm damage (or you could lose your no claims bonus if it’s not protected). That’s because most weather damage technically falls under the at-fault claim category — not because you are to blame for the damage, but because your insurer will not be able to recover its costs from elsewhere as it would in the case of a car accident that was another driver’s fault. In rare cases where another party was to blame, you may be able to claim the costs back from their insurer — see the debris section below for more information. Flood damage is a common and serious cause of winter car insurance claims — according to recent stats from the AA, insurers write off about 70% of cars that have been submerged, either due to electrical faults or engine damage caused by water. If you think flood water may have got into your engine while your car was parked, do not start the engine — this can cause irreparable damage, and your car may be able to be saved if it can be dried out sufficiently before the engine is turned on. If you drive through flood water, the damage to your car could be substantial even if there seem to be no problems at first. Water can be sucked into the engine and cause an instant breakdown, or it can cause rusting or electrical damage that can cause a serious issue later on. Most car insurance policies will state that you must take reasonable care to prevent any harm from coming to your vehicle — it depends on your insurer, but some will find that you have been negligent if you put your car at risk by driving through flood water, and may reject your claim. It’s safer to avoid driving through flooded roads, especially those marked with warning signs. If your flood claim is successful, any damaged contents such as your stereo and upholstery should be covered under a comprehensive car insurance policy. High winds can also cause significant damage, and debris claims are another common occurrence during storm season. One of the most common results of flying debris is windscreen damage. Some comprehensive insurance policies include windscreen cover, so check your policy carefully. If you’re covered you should only have to pay a low excess and you will not lose your no claims bonus. 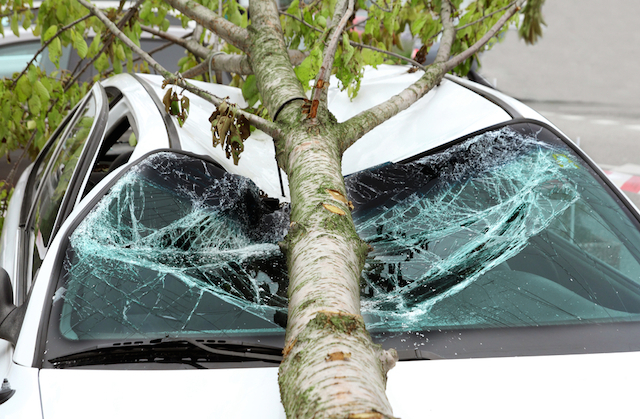 If your car has been damaged by larger debris, such as a falling tree, don’t attempt to move it without professional help. Make sure you take photos of the debris as well as the damage, as it could help with your claim. If your car has been damaged by someone else’s property, a falling roof tile or a tree from a neighbour’s garden for example, the situation becomes more complicated. You may be able to recover the costs from the homeowner’s home insurance, but only if they were negligent — by leaving their roof in a state of disrepair or by not securing a damaged tree, for example. In any case, you should go through your car insurer as they will deal with your claim and ensure any repairs are carried out quickly. Contact your insurer immediately. Your insurer may have a 24 hour emergency helpline, and some may not accept your claim if you fail to notify them within a set period after the incident occurred. Take photos of the damage, and avoid moving any debris until you have photographic evidence. This may be useful for processing your claim. Arrange temporary repairs if necessary. Ask your insurer for advice - they are likely to be processing a lot of claims for storm damage and may recommend that you seek a temporary repair to prevent the damage from getting worse. If you do this you should tell your insurer you’re doing so and make sure you keep receipts as you will need these to claim the money back later.